Obituary for Robert Nestor Shewchuk | Langeland Family Funeral Homes, Inc.
a degree in chemical engineering, working for the last 15 years of his career for BASF in Livonia, MI. He was an avid golfer and bridge player. Bob is survived by his loving wife of 59 years, Jeanne (nee: LaBelle); by three children: Thomas (Bonnie) of Rancho Murieta, CA, Jeffrey (Michelle) of Eagan, MN, and Kimberly Varney (Jeffrey Sobell) of Kalamazoo; by nine grandchildren; and by one brother, Bruce (Sandra) of Sturgeon Bay, WI. Bob was predeceased by his parents, William and Anne, by two brothers, William and Dennis, and by his eldest son, Steven. 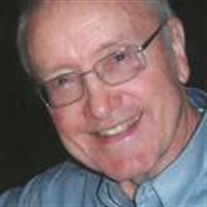 Bob's life will be celebrated at St. Catherine of Siena Catholic Church, 1150 W. Centre in Portage, on Friday, May 11, with visitation at 10:00 am prior to Funeral Mass at 11:00, and lunch following. In lieu of flowers, any donations may be directed to the Evans Scholars Foundation, One Briar Road, Golf, IL 60029, supporting the golf caddie scholarship that funded Bob's education.